We make houses based on the traditional construction method, considering the following factors. 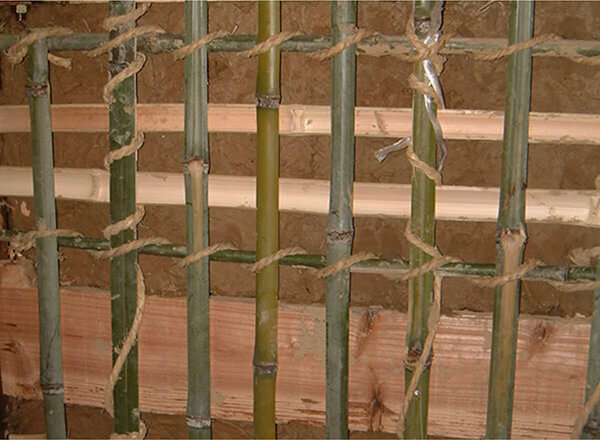 We use air dried lumbers for the framework structure of the house. A carpentry craftsman observes the nature of a wood and puts it to the right place. We judge the precise place where a straight wood or a strong curved wood can make the most of its distinctive feature. In addition, the timber which is properly predicted the deformation of aging can be used for a long time. We establish a house structure with only a wooden timber framework.  With the help of many contact points between timbers, the framework will have a tenacious structure and damping effect at the time of earthquake. Hardware is easy to get damp. If the metal is rusted with its moisture, it will corrode woods in its surroundings. There is a possibility that it can not bear the tremor of the earthquake. 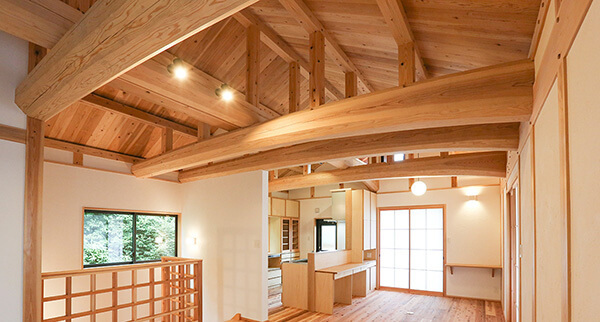 Therefore, the basic structure should be based on a precise timber framework, and the hardware is recognized as supplementary use. The penetrating tie and earth wall are both ready to defend external force such as earthquake. The combination of the flexible penetrating structure and the fragile earth wall secures a certain degree of solidness. At the time of earthquake, the earth wall will first resist and break down because it is fragile. When the earth wall breaks, it consumes large energy and has a high damping effect. 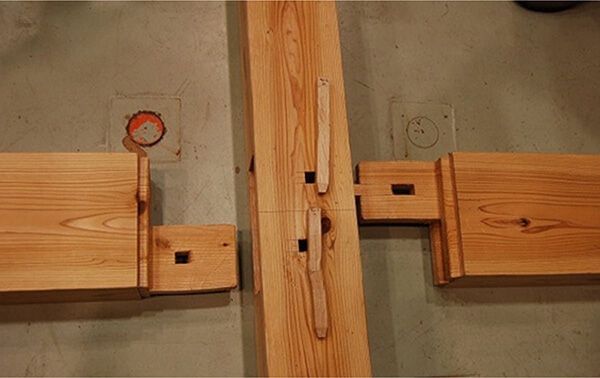 Then the penetration tie and junction will work for the earthquake. Since the framework built by a penetration structure theory has high deformation performance, even if the building is greatly inclined, it will not collapse completely. The framework provides time for evacuation in case of emergency, and protects the lives of the residents. The comfort of a room depends not only on the temperature but also on a combination of the factors, including humidity, airflow, radiation, and more. We strive to provide an indoor environment that does not rely on air-conditioning by electric air conditioners, with a primary focus on how to spend a long and hot summer. Our efforts are not limited to the insulation of roofs and outer walls but also tackle the issue of heat shielding. In the summer, preventing the heat of direct sunlight from entering the house has a significant influence on the comfort of the room. To this, it is effective to deepen the eaves, place a heat-insulating layer between the roof and the outer wall, and create an air passage in the room. Of course, one may rely on electric air conditioners when the heat is intense. In the winter, heat storage is important. During the day, we arrange a large window southward to absorb as much sunlight in the room as possible. In the evening, by closing the shoji inside the window, a sheet of paper reduces the coldness transmitted from the window glass. Furthermore, because the earth floor and earth walls exhibit high thermal storability, the accumulated heat will sustain gentle warmth. Moreover, the compatibility with a wood stove is also excellent. 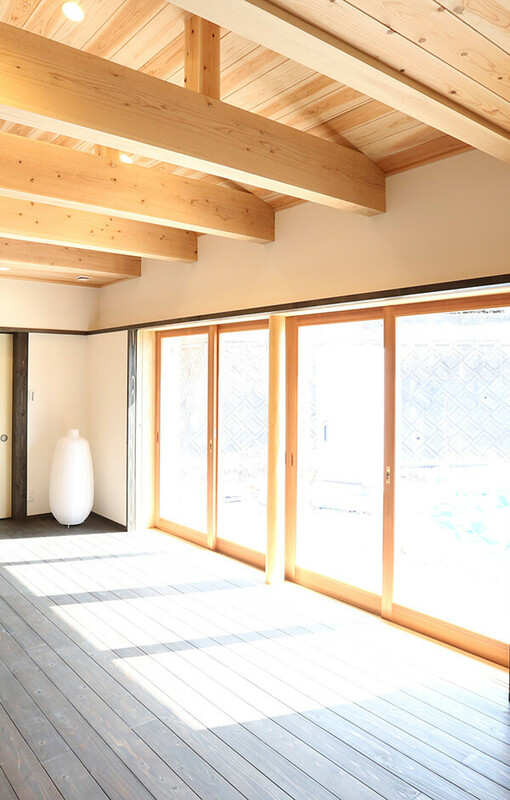 To live together symbiotically with the humid environment in Japan, we usually use materials for interiors that tend to have high moisture absorbing and releasing properties, such as trees, earth, and paper. Furthermore, to prevent internal condensation and mold formation, we try to avoid the use of materials such as plywood and vinyl cloth that stop moisture movement. The construction of an indoor environment mainly consists of solid wood such as cedar and cypress as well as plaster and soil finishes. A material with high moisture absorbing and releasing performance absorbs moisture when it is humid and releases moisture when it is dry. 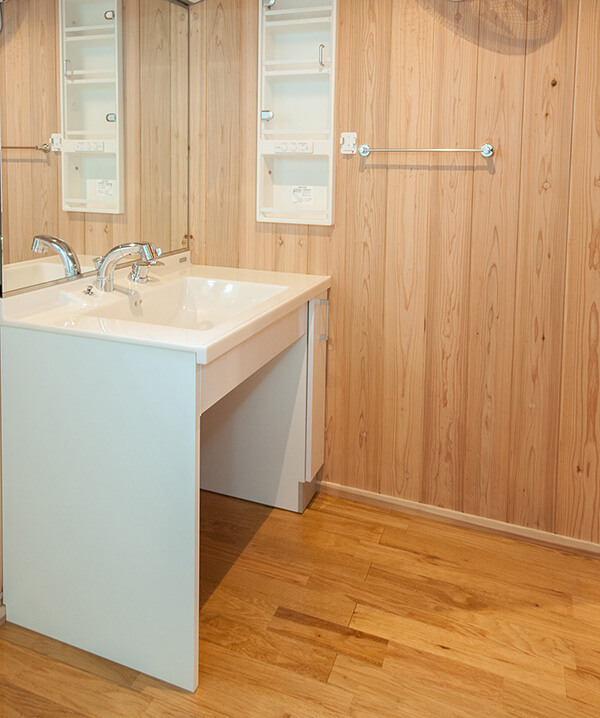 The change in room humidity can be suppressed to maintain a relative humidity of 50% to 70%. 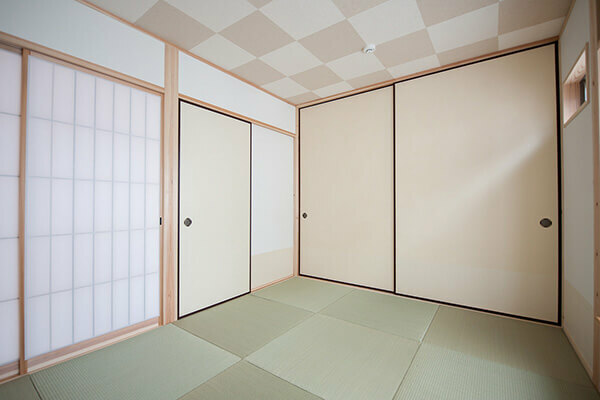 In particular, the cedar boards that we frequently use feel dry and smooth even during the rainy season, and they constitute one of the indispensable elements for living under the highly humid conditions in Japan. Furthermore, ensuring ventilation in the room and using materials with low moisture permeation resistance is also very important to keep the used wood in dry state. We usually build tile-roofed houses. The merit of roof tile lies in the fact that the tiles themselves tend to have a long life and partial repair can be easily carried out. Compared to sheet metal and thin slate roof tile, which have a lifespan of approx. 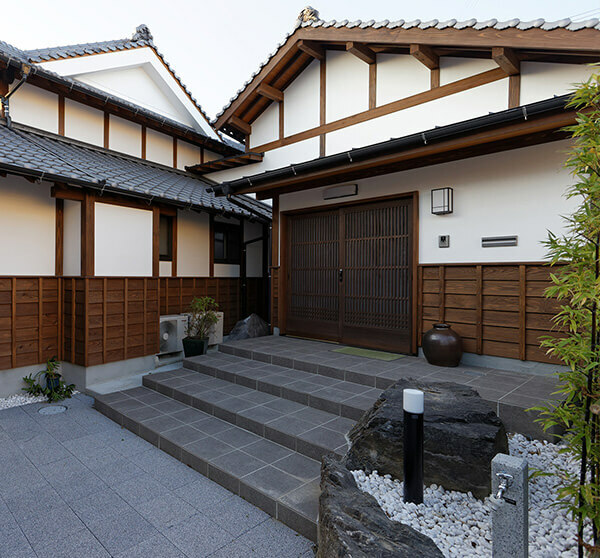 30 years, roof tile is durable enough to last from 50 to 100 years. In addition, it is also possible to partially replace the broken tiles, and roof tiles are considered to be easy to maintain. In current tile construction, all the tiles are nail-fastened so that the tiles do not fall off due to typhoons, earthquakes, etc., assuring relative safety even in the event of a disaster. In addition, on the parts with heavy rain on the outer wall, adding a cedar board, which is easy to replace, facilitates the wall maintenance. As with roof tiles, partial repair is possible just where the damage occurred. The depth of the eaves greatly influences the durability of the outer wall, and deepening the eaves has the effect of protecting the outer wall from rain. In a house with shallow eaves, deterioration of the exterior wall occurs more quickly. We use natural materials as much as possible, such as trees, earth, stone, and paper, particularly for the interior. Natural materials are friendly to the residents, creating a comfortable space. And they are also environmentally friendly, because they will return to the earth. When we dismantle a house, we try not to disturb the environment. We do not want to impose garbage problems on our descendants.